It’s only a four-hour plane ride away. If you think that the Philippines’ 7,107 islands is impressive, Indonesia has a whopping 17,508. As one of the 65 visa-free countries for Philippine passport holders, Indonesia is easy to visit. It’s a four-hour plane ride away, and budget flights pop out every now and then. Best of all, our fellow southeast Asian country is brimming with tropical accomodations and activities that won’t make a dent in your wallet. Compared to Manila’s rates, yoga classes are cheaper in Bali. If you’re looking to do your own version of Eat Pray Love, go to heart of Ubud where author Elizabeth Gilbert found her inner peace. The most popular choice is Yoga Barn, a sprawling retreat center with yoga classes of all levels, community healing activities, a vegan restaurant, and their own guest house. Yoga Barn’s rates are actually pricier (P490 for a drop-in class and P3,400 for a 10-class pass) than its neighboring studios like Ubud Yoga House and Intuitive Flow (P300-430 per drop-in class and and P2,150 for a 10-class pass). Whatever yoga studio you choose, you’re guaranteed a unique experience with the jungles of Ubud as your backdrop. You’ve probably seen them on the IGs of influencers and travel bloggers, but they’re not as glamorous as they seem. Not to be confused with a regular swing attached to a small tree, pay-per-ride jungle swings will make your stomach churn. There are several heights to choose from, and you must sign a waiver before they attach a safety harnesss around your waist—just in case. They push the swing to a height of 16 to 255 feet for about 10 minutes. Try: Bali Swing in Bandung, Zen Hideaway, and Alas Harum Agro Touris—all in Ubud. Flowy dress optional. Pose in an Instagram park. If your stomach can’t handle the swing height, these jungle swing destinations also offer photography setups for Instagram addicts. For an entrance fee of less than P50, you may take as many photos as you like in the different setups and vantage points, like the famous human-sized bird’s nest. Try: Wanagiri Hidden Hill at Sukasada or Wisata Selfie Park. A rock formation off the Indonesian island of Bali, Tanah Lot means “land in the sea.” One thing you should know about the iconic Pura Tanah Lot is that you cannot enter the main pilgrimage temple, and if there’s a high tide, you can’t cross to the rock base. Your IDR 60,000 (P215) entrance ticket gives you access to rows upon rows of souvenir and food stalls, and other smaller temples. Go right before sunset for dramatic shots. Visit quirky cafés and restaurants. Indonesia’s growing number of cafés and restaurants are Instagram-friendly. Yes, your food will get cold because you’ll get so caught up taking photographs of every colorful corner, bedazzled wall, and creative setup—and we can’t blame you. In Bali alone, there are dozens to choose from, such as the famous Motel Mexicola in Seminyak, La Laguna in Canggu, La Plancha in Denpasar, and Sea Circus in Seminyak. Don’t worry; the food is good, too. Party to your heart’s content in Kuta. If you’re heading to Bali to drink and dance the night away, Kuta (and the neighboring Seminyak) is the place to be. Whether you prefer daytime poolside parties or nighttime fist-pumping events, just follow the line of tourists from around the world (especially Australians) who know exactly which bars are the best for music, booze, and grub—like La Favela, Sky Garden, Paddy’s, Finns Beach Club, Single Fin, and Potato Head. If you need a break from the party scene of Kuta and Seminyak, head to Nusa Penida, a one-hour boat ride from Sanur Beach in Denpasar. 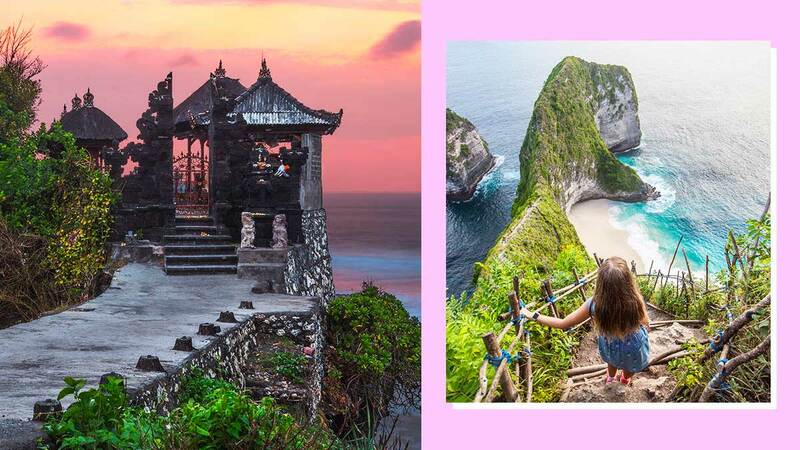 Nusa Penida is part of three Nusa Islands—the other two are Nusa Lembongan and Nusa Ceningan—just southeast of mainland Bali. There you can explore caves, cliffs, beaches, snorkeling spots, and waterfalls—each with its own amazing view sans the heavy crowd. Don’t forget to take a selfie with the backdrop of Kelingking, a white sandy beach enclosed by a cliff that looks like a T-Rex. View Mt. Agung via Puro Lempuyang. The volcano eruption scare has finally subsided, but the government continues to warn tourists from climbing or getting close to Mt. Agung during seismic activities. For a safe but breathtaking view of this majestic volcano, there are several locations around Ubud. The most popular is Puro Lempuyang, a sacred temple where the gate opening perfectly frames the volcano and surrounding clouds. Indonesia’s population comes from different religious backgrounds, so you are sure to find a traditional festival based on their cultural and religious beliefs. One is the Toraja Funeral Ceremony or Rambu Solo, where Torajans perform funeral rites to send off departed loved ones. Another famous tradition is Neypi, also known as Day of Silence, where the Balinese practice fasting and abstinence. Everything is closed that day, but on the days preceding Neypi, tourists may observe the local rituals, decorations, and ceremonies. If you’re looking for a festival where you may actually partipate, there are several to choose from, such as Ubud Writers & Readers Festival, Southeast Asia’s largest cultural and literary event; Bali Spirit Festival, a yearly celebration of yoga, dance, and music; and many music festivals that feature both local and international acts, like We The Fest or Jakarta International Jazz Festival. Meet the dragons of Komodo Island. Komodo Island forms part of Komodo National Park. This UNESCO World Heritage Site is home to the world’s largest species of lizard, the Komodo dragon monitor lizard. After you book a boat ride to go lizard hunting, make sure you listen to the local guide’s do’s and don’ts as Komodo lizards are dangerous creatures. Ready your cameras not just for the reptiles but for panoramic views of your mountain trek. If you’re into diving or snorkeling, get in touch with their local dive centers. Whether you go to mainstream destinations like Bali and Java or distant islands like Flores, there are so many waterfalls to see in Indonesia. Some are multi-storeys high, like Sipiso Piso Waterfall in North Sumatra; others are so small that you can slide down them, like Moramo Waterfall in Southeast Sulawesi; while others are best seen from a panoramic view, like the Coban Sewu Waterfall in East Java. Whatever island you choose to visit, don’t skip a day trip to the waterfalls. There’s more to Indonesia than Bali and Jakarta. For adventurous travelers who want to get away from the usual, head to the likes of Gili, Flores, and Padar—islands that aren’t so tourist-heavy. Activities include surfing, diving, snorkeling, trekking, or just sit lazy with a fresh coconut under the sun. Aside from the famous Tanah Lot, there so many temples to see in Indonesia—some in ruins, while others are well-preserved. Popular choices include Pura Ulun Danu Beratan and Goa Gajah, but there are dozens more to choose from, depending on your location. Use your Pinoy haggling skills. You know those famous rattan bags that every single fashionista has included in her OOTD? They’re originally from Indonesia. If you purchased one from a reseller in Manila for P2,500-4,000, you’d be excited to know that you can get them for P1,000 or less in Indonesia, depending on the location, number of items purchased, and your haggling skills. But don’t just focus on rattan bags. Whether you’re in Bali or Jakarta, check out the macrame creations, bohemian accessories, wood carvings, leather sandals, souvenirs, and other flea markets finds that are cheaper by the dozen. When you’re in a hotel in Bali, you just need to hop on a taxi or motorbike and travel for 30 minutes or less to get to the picturesque Tegallalang Rice Terraces. If you have more time to spare, Jatiluwih Rice Terraces (a UNESCO World Heritage Site) is about an hour’s drive away. Better yet, go a little further and explore Canggu’s rice fields after a day of surfing. For the ultimate experience, book a hotel designed like traditional Balinese houses with the actual jungles as your window view or poolside backdrop. It’s pricier than regular hotels, but it will make you feel one with mother nature. If you all you can afford is a no-frills budget hotel, that’s fine. Just visit a cultural village like Tenganan, Batubalan, Tarung, and Waitabar, where you can see traditional Indonesian houses, and learn about their culture and heritage. Going vegan, whether temporary or long-term, is easy and inexpensive in Indonesia. You won’t have a hard time finding vegan restaurants because they’re everywhere—even in the sidestreet warungs. The produce is fresh, and even meat-based restaurants offer vegetarian or vegan options.